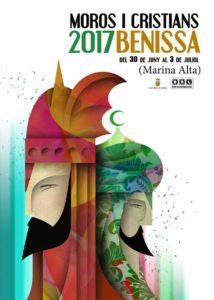 08.30 pm Festival music concert in the Jaume I square, performed by the “Colla de Xirimiters Pere Bigot” and “Asociación Lírica y Musical de Benissa”. 11.00 pm Presentation of the Standards, StandardCarriers, Ambassadors and Captains in the enclosure of the castle, and streetcry for the festivities headed by Dª. José David Ivars Pellicer. To finish the act, firework display courtesy of Pirotecnia Vicente Caballer. Next, in the Jaume I square, actuation of the Capital ‘90 orquestra. Bar service for the benefit of the captain “filaes” 2018. Filà Pirates y Filà Zairenyes. 12.30 am Rememberance of the deceased “festeros” at the local cemetery. 07.30 pm Musical band entrance. 08.00 pm Great Entrance from Valencia Street until the end of Nou Street. Christian Standard and the Standards of Christians“Filaes”. Moor Standars and the Standards of Moors “Filaes”. 11.00 am Street parade of all the “filaes”, visiting the pensioner’s residence and carrying the image of the Saint Peter the Apostle. 12.00 am Offering and Mass in honor of our Patron Saint Peter the Apostle. 06.30 pm Infants entrance and XXVII competition of the “Cabos de Escuadra”. 08.00 pm Siege of the Moors from the Convent Square until the Castle enclosure. Moorish embassy and taking of the castle by the Moorish troops.